The number of people taking up Apprenticeships in January were 21% down on the same month in 2017, despite showing a 15% year-on-year increase at the start of 2019. A total of 29,100 starts recorded so far in January 2019, compared with 36,700 in January 2017 and 25,400 in January 2018, according to the Department for Education’s monthly apprenticeship statistics update. The result means that the take-up of apprenticeships remains significantly behind those prior to the introduction of the Apprenticeship Levy, which the Government announced in the 2015 Summer Budget as part of its drive to train three million new apprentices by 2020 and address the decreased focus on employee training outside the work place. 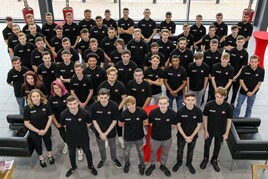 Steve Nash, chief executive of the Institute of the Motor Industry (IMI), said that January’s growth in apprenticeship starts over the same period last year was “welcome news”, but expressed conercen that the figures remained “significantly lower than those achieved before the Apprenticeship Levy was introduced”. He said: “At the IMI we firmly believe that businesses need as much support as possible in order to understand how to they can best use the training funds to which they’re entitled. Between August 2018 and January 2019 for the 2018/19 academic year here have been 225,800 apprenticeship starts reported to date. The figure represents a 10% rise on the 206,100 reported in the equivalent period in 2017/18, but a 16% decline on the 269,600 in 2016/17. Skills and apprenticeships minister Anne Milton said that an “overhaul” oi fthe Apprenticeship Levy system a year ago was to credit for the rise in recent months and hailed the result as “excellent news”. Nash believes that more automotive sector businesses need to wake up to the benefits that apprentices can offer, however. He said: “There is no question that apprentices deliver real value for businesses as a two year study undertaken by the IMI proved. “The results found that apprentices typically generate an ROI between 150% and 300%, and usually generate profit within 12-24 months. Home grown apprentice-trained technicians invariably outperform market-recruited technicians, and this can reduce long-term recruitment and training costs.